Heroic alpinism on the Dolomites begins during the 50s with personalities such as Bepi De Francesch and Cesare Maestri. Stiff boots, pitons and etriers to tackle the overhangs, then Messner comes along and, with him the sixth-grade revolution. A new generation of climbers wears basketball shoes, until the arrival of the first climbing shoes. Founded in 1928 and actively operative during the second World War, the La Sportiva shoe factory comes on to the scene of great alpinism between the 50s and 60s of the 20th century. The theatre is typically the Dolomites and it is the time of the direttissime routes, known as the routes which followed the path a drop of water would take down the mountain. Alongside Cesare Maestri, the figure of Bepi de Francesch stands out, whose reserved character contrasts with the mediatic triumph of the achievements of the time. There is not a trace of exhibitionism in this man from Belluno enrolled in the Guardie di Pubblica Sicurezza and generous participant in the Police’s Fiamme Oro Alpine School, where photographs of that time show him almost always wearing leather boots, hanging from aiders and steps, looking surprised and wearing a woolly hat. De Francesch expresses the will, if not the duty, of climbing direttissime routes. The centenary of the Unity of Italy was celebrated in 1961. The country was in the midst of the economic boom and had just discovered cars and television. Amongst the most beloved heroes of the Italians was Walter Bonatti, who was involved in a terrible tragedy on the Central Pillar of Frêney in July 1961. Seven international climbers were surprised by a storm at over four thousand metres of altitude, not far from the summit of Mont Blanc; after a retreat of several days Bonatti managed to save only two other climbers, apart from himself. Once more alpinism ended up in the hands of the grinding media, between those who considered it suicide and those asking for prudence and mercy. It remained unacceptable that anybody could die in the snow in mid-summer in this era of technological miracles. On the other side of the Alps the public was passionate about the new project by Bepi de Francesch: the fantastic yellow prow of the Piz Ciavazes, 2828 m, which stands over the hairpin bends of the Passo Sella, the busiest road in the Dolomites. The Ciavazes rock face, apart from its beauty, provokes the force of gravity. In Val di Fassa they say «If it were upside down it wouldn’t be more than fourth or fifth grade, and with excellent ledges in the middle»; a pity it is an example of upside down geology, with roofs instead of steps. In September 1961 De Francesch decides that the moment is right to «attack that devil of a crack» with his trusted climbing partners Quinto Romanin, Cesare Franceschetti and Emiliano Vuerich. «If I had climbed it, I would have named it after the Centenary of Unity», said Bepi, therefore there was also a patriotic justification. But first you have to climb it and it’s almost a public exhibition. Bepi’s biographer, Tommaso Magalotti, recounts that «For almost the whole climb there was a crowd of spectators which at times slowed down and sometimes actually blocked the traffic on the pass. They all stopped their cars, got out and looked upwards, curiously following the unusual spectacle». First and foremost it is a question of equipment. On the evening of 11 September the four climbers get settled in two tents at the foot of the arête. They have food for a few days, one hundred and fifty normal pegs, one hundred fixed pitons, a few wooden wedges for the wide limestone cracks, fifteen etriers, various climbing ropes (of which two are one hundred metres long) and a long cordelette to recover gear. They are wearing La Sportiva boots with Vibram soles. On the morning of the 12 September de Francesch and Romanin climb the first vertical section and place pegs in an overhanging corner, then the first ceiling of the arête, which the leader tackles directly: «Between me and the rock a desperate fight begins: I tell her that I love her, but she doesn’t believe me». Half-way through the afternoon the two of them reach the large roof. De Francesch finds a flag and sticks it under the roof. As soon as the Italian flag blows in the wind that evening, there are shouts of ‘Long live Italy’ coming up from the Passo Sella road. The second day is dedicated to the central roof which sticks out five metres into the void, it is perfectly horizontal. It is a job requiring strength and patience: almost three hundred strokes of the hammer are needed to make a hole in the rock and allow us to place the pitons; fifteen blows and a deep breath, another fifteen and a shake of the arm. «I was sculpting my own route. While I move along that large roof I thought of Michelangelo who in that same position painted the Sistine chapel’s vault ». In the evening of 13 September, the four Fiamme Oro policemen make a bivouac hanging off the pegs and on the morning of 14th reach the ledge named Cengia dei Camosci, half-way up the wall. By now the arête has been climbed, but ethics impose that they should reach the summit of Piz Ciavazes. They get there an hour and a half later under a pastel blue September sky. They take out the flag and let it flutter again. They call the new route Italia 61. After the epics of aid climbing, alpinism changes direction. It moves towards free climbing and the great winter ascents of the Andes and Himalayas. Boots can smell this change in the air: they become increasingly softer and lighter for free climbing and heavier and more rigid for high altitude snow. Lino Lacedelli from the valley of Cortina d’Ampezzo and a consultant for La Sportiva, personifies the two trends because he climbs the Dolomites and is also a Himalayan alpinist. 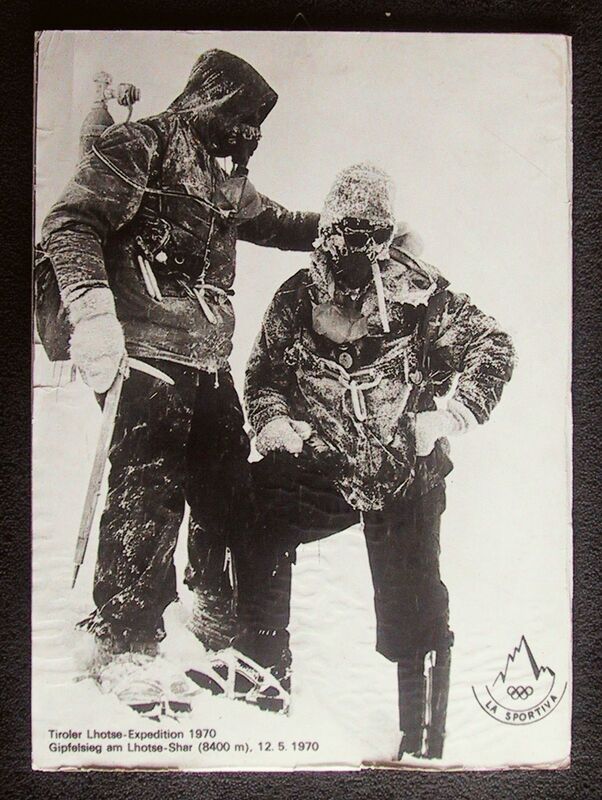 In his youth he climbed some very difficult walls like the Cima Scotoni face and in 1954 he reached the summit of K2, the first man together with Achille Compagnoni to reach the top of this ice giant. In the 60s alpinism underwent a kind of centrifugal force: the dead weight of tradition refines and creates heavier gear, while the breath of transgression tends to reduce, simplify and speed up. Even the enfant prodige Reinhold Messner interprets both paths, and he does it by running and eliminating more and more. In 1968, before losing his brother Günther on Nanga Parbat, he wrote that pitons and technology were the ‘Murder of the Impossible’. In the meantime the skiing market is invading the Alps, bringing the sport of the masses into the valleys. Huge ski stations appear in the Alps, very much like the towns down in the valley. The Delladio family follows this new market for ski boots while they are still made of leather, which is their historic material; when plastic arrives and skiers start to wear rigid, synthetic and coloured outer shells, the Delladios obviously stop. Following in their long tradition, the company from Val di Fiemme turns its attention and energies to alpinism and climbing, but there, too. And to think that at the beginning of the 70s climbers were still wearing hand-knitted socks and knee breeches. A kind of mountaineering uniform. Within ten years everything had changed. Climbers of all ages greet each other like old friends, use English words like free-climbing, wear overalls with Fila and Cerruti written on them and climbing shoes with soft soles made by the French EB and La Sportiva. The grey-green colour of the alpine troops is over, a vague memory of the First World War. New protected rock climbing is shown off on rock faces, there is provocation, no one hides any longer. If for alpinists who climbed during the heroic era completing a climb meant reaching the summit, which like a victorious medal it coincided with the cross standing out on the ridges, with the ‘Nuovo Mattino’ era of climbing, summits and peaks disappear: there is no end, and no finish. To finish a climb there is only the void, and there is no longer need to reach a peak. Rebels have introduced the provocatory term plateau which is much more than a geographic concept. It means that to enjoy yourself it is sufficient to climb the rock face and the climbing becomes and end in itself, a sport for everybody. Almost a mass sport. The Delladios take advantage of the situation, also because at that time plastic was being used for ski mountaineering boots. After an intermediate passage of the Yosemite shoe invented by Alberto Campanile, a strong climber at the time, in the early 80s a winning intuition moves the company’s focus to the sports climbing sector enrolling popular personalities like Heinz Mariacher, Luisa Iovane, Manolo and Roberto Bassi. 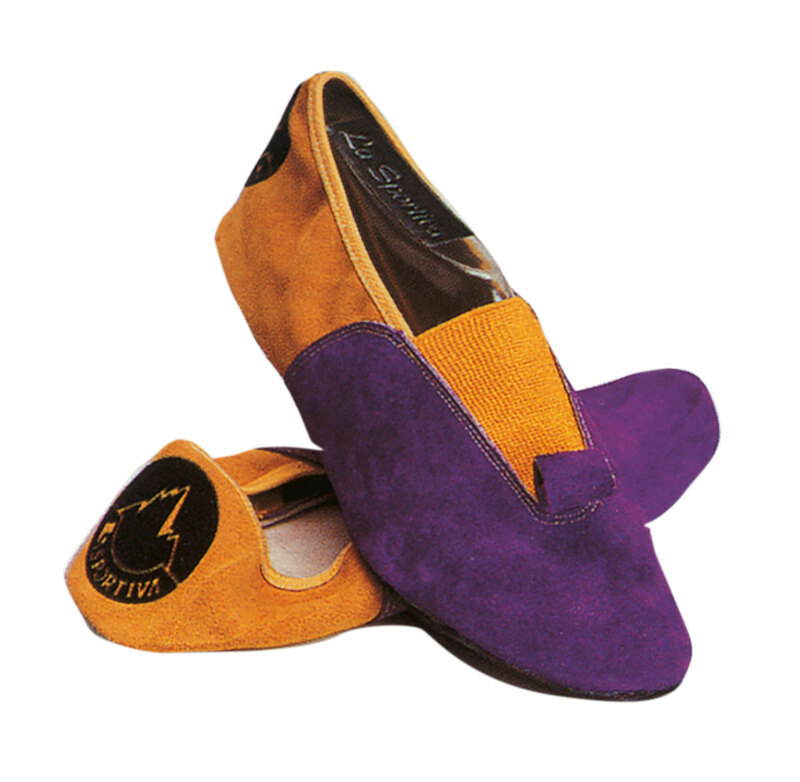 An innovative climbing shoe was invented and produced in the colour combination of purple and yellow - in fact the Mariacher shoe, in 1981 - it will be the market leader of avant-guarde products and in a short time will signal the success of the brand world-wide. Heinz is a strong climber and passionate experimenter, but also has a business spirit. While designing his climbing shoe he understood the collective imagination of climbers was fervently awaiting the arrival of a new soft, precise and a shoe possessing a little bit of magic. Wearing their soft shoes, everyone felt they climbed better and above all more modern. The purple and yellow Mariacher is the new uniform, a style, the symbol of change. In recent years the evolution of the climbing shoe had three concepts: lightnen, flexibility and colour. From the stiff climbing boot, softer and more flexible soles took over like the Civetta Flex, produced again by La Sportiva. Some people had already started to try tennis or gym shoes, adding the inventive Airlite soles. In the meantime the first ad hoc climbing shoes started to arrive from France, the mythical PAs by Piere Allain (their production started in 1947) and the painful EBs. 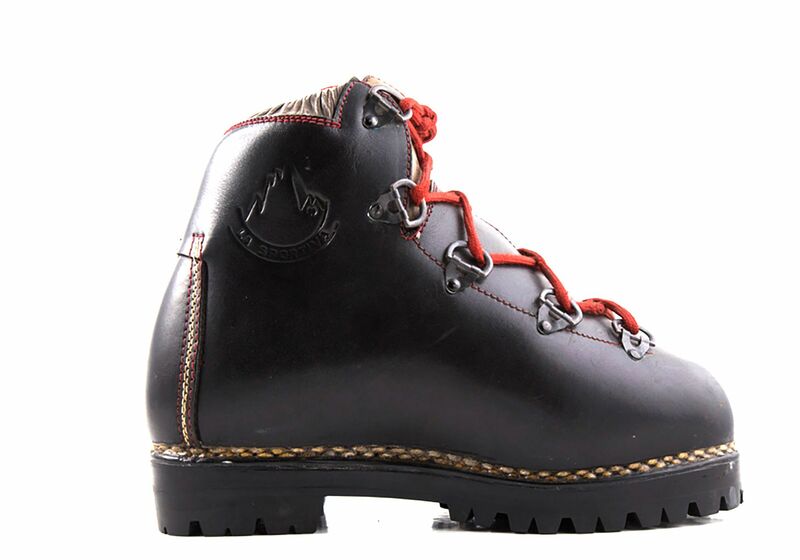 The model Canyon by Asolo came out in Italy in 1976, studied by Yvon Chouinard and Alessandro Gogna. But the result was still too hard on the feet and because of it being rigid, it lost friction. Even the colours were still timid, respectful and almost demure. The revolution, after the salamander colours of San Marco’s shoe by Alessandro Grillo, will be established in the climbing market with the purple of the Mariacher, a colour never before seen in the mountains. The new climbing shoe with irreverent colours is precise, ductile, comfortable, much lower round the ankle and allows high level performance. A few years later in 1984, the first slipper shoe modelled on gym shoes appeared exactly, almost as comfortable as a slipper, ideal for playing on crags. In the summer of 1985 the heresy of all heresies arrives: vertical competitions. They compete on the historical Militi rock face in Valle Stretta, above Bardonecchia, in Piedmont. Thanks to the incentive of the Turin academic member of the Italian Alpine Club, Andrea Mellano, the journalist Emanuele Cassarà and the champion Marco Bernardi, from the 5th to the 7th of July the first European Sports Climbing Competitions took place and judges made their first appearance in the anarchic and libertarian history of climbing with the blessing of Riccardo Cassin, ‘The Greatest’ in 20th century climbing. Athletes, male and female, with numbered bibs, perform in front of hundreds of joyful spectators, in a collective rite mindful of Woodstock and rock concerts. La Sportiva believes in this and supports it right from the start, offering themselves as sponsors for Sport Roccia at Bardonecchia and Rock Master at Arco and choosing first class athletes like Stefan Glowacz, Didier Raboutou and Catherine Destivelle. 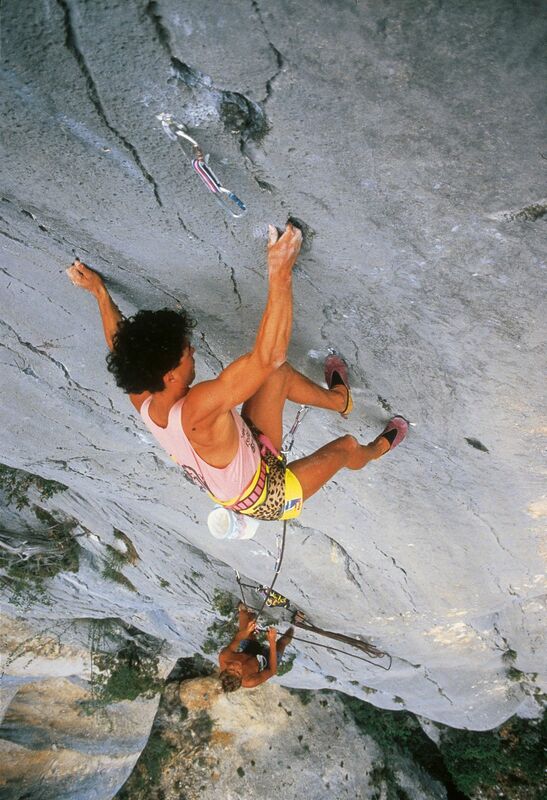 Manolo was also part of this group and was against these competitions, but he was the most famous climber in Italy. The most charismatic. His friends call him the Magician for his capacity to read the rock and invent impossible lines, imagining even unseen holds. He calls it motor intelligence. He came to the attention of the climbing world by free climbing some prestigious routes in the Dolomites like Carlesso and Cassin at Torre Trieste, in the Civetta mountain group, or Emilio Comici’s route on Cima Grande di Lavaredo, and repeating the dreaded route ‘Via attraverso il Pesce’ on the south face of Marmolada with Mariacher, Iovane and Pederiva. Simultaneously he has opened a handful of extremely difficult routes on large walls of limestone and in the world pushing the level of sports climbing on rock to the pinnacle. Anyone repeating his routes ascertained personally with great effort the mysterious level of the magician's routes, because Manolo had the tendency to not advertise his feats, always choosing hidden and far away walls. The first public revelation of his talent is linked to an area which in those days nobody visited, it is called Totoga, a modest rock step in the Dolomites which divides the Valley of Vanoi and the Schener Valley, not far from Imèr and Fierda di Primiero. To the east Totoga presents a vertical rock face which is accessible almost all year round, the ideal place to tackle high difficulties. Manolo goes there assiduously, exploring and climbing the compact and sunny rock, he invents a few routes, until he leaves his lasting mark during the summer of 1981 which lasts: «I was weighted very little in those days- he says - I had it in my head that being so light I could hang off absolutely anywhere and that day I managed to climb a very difficult move on Mattino dei maghi». In Manolo’s vocabulary, 'very difficult' is a combination of scary words. In fact throughout the successive years, pushed away by the difficulties and the spartan bolting, any would be imitators discovered that Il mattino dei maghi represents an unrepeatable exploit. Up the entire pitch, Manolo placed only one wooden wedge to protect himself, two normal pegs and two old style pitons, the route though reaches the difficulty of ninth grade superior (7c+ on the French scale)! In Europe, in those days, Il mattino dei maghi corresponded to the maximum level ever imagined and climbed. Not even the great French champions, Patrick Berhault and Patrick Edlinger, had succeeded in climbing so high, even if France was the undisputed home of sport climbing. In 1984, in the name of lightness and the utmost sensitivity, the ‘Ballerina’ shoes are crafted. Not only will they give their name to the model, but to a new category of climbing shoes.